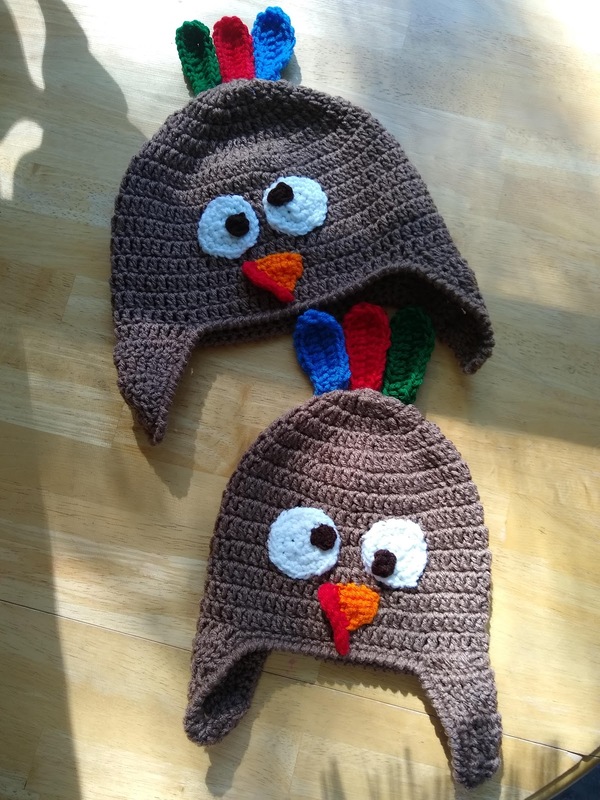 In addition to my meal preparations, I also got to work crocheting a couple turkey hats for my turkey girls. I started yesterday, so it was a rushed job. I finished just a few minutes ago, cutting it close before our 3 p.m. meal. They're reminiscent of hats I made when Jane was little -- her second Thanksgiving, and she had just turned 1. (That was the year I wrote about all the TV shows I watched as my NaBloPoMo fodder. HA.) But I did change things up a little, giving the turkeys cross eyes (reminiscent of Hei Hei from Moana, which incidentally is leaving Netflix soon so I think I'll probably buy a copy -- should I get an actual DVD or just a digital/streaming version, like from Amazon?). I made Jane's hat too big because I was working on it after she went to bed. It's big enough for my giant melon, which should have been a clue it was too big. She wants to wear Liv's, which is only slightly small for her. Crochet stretches so it's not bad. The feathers were the last things added, and if I'd had more time I could have devised a plan to crochet around pipe cleaners to give them some structure. I tried but couldn't work it out in the 30 minutes of crochet time I had left. So floppy feathers it is. The snoods on the beaks are pretty cute though -- I didn't crochet them down so they're a little floppy too, but in a good way. Not sure if the girls will actually wear them (please, please, please let me get a Facebook pic! ), but I'm hoping we'll still have a pleasant Thanksgiving experience at our friends' house.